There's a rest area on the turnpike that is a standard stop for us on our way up to visit Mark's parents. During the summer, they have a small farmer's market with vendors selling fresh fruits, vegetables, cheeses, and bread. I love the fact that I can take a quick driving break and pick up some healthy food at the same time. Take that, McDonalds! During our most recent stop, I bought a basket of fresh peaches. They weren't giant peaches but petite yet shapely things. So pretty. So juicy. 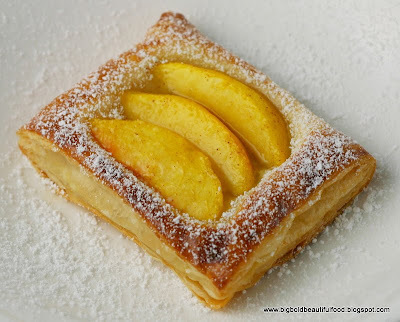 For dinner, I decided to make a quick fruit tart using puff pastry. 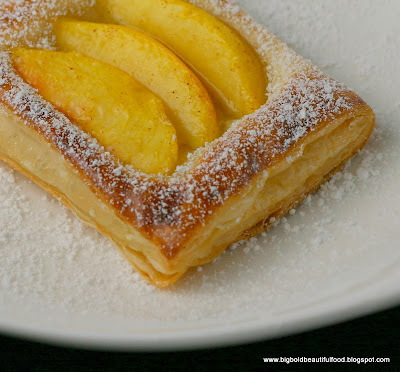 There are hardly any ingredients in this tart: peaches, sugar, apple pie spice, and puff pastry. All I did was peel and cut the peaches and put them in a bowl, sprinkle them heavily with sugar and a little apple pie spice. While the peaches macerated in the bowl, I took out the puff pastry to defrost for 30 minutes. When the pastry was defrosted, I cut the pastry in thirds, each third into four pieces, and then lined up the peaches on each one for 12 individual tarts. Alternately, you can make three long tarts out of each third. I threw the tarts in a 400 degree oven for 20 minutes and we had one of the most lovely summer desserts we could wish for. Check out Veggiebelly for a recipe and a wonderful pictorial. Wish I'd found this earlier today. I made a go at making a more intricate tart and the crust ended up more like a cookie. You have just managed to capture summer on a plate...beautiful!!! so easy yet so yummy! can't wait for summer so i can make them. Puff pastry is the answer to just about everything! Quick, rich and can be sweet or savory. What a beautiful photo! Yum. This is my favorite kind of food--a few great ingredients prepared well. I know what I'm having for dessert tonight! This looks lovely. I think tarts are so pretty and I love making them. Unfortunately peaches are not so available here but mango wld be a nice replacement. It has the same beautiful colour and is smooth in texture as well. Thanks for sharing. Im still thinking about the spanish rice! :P gotta make that b4 I go nuts. easy peasy and pretty too! yum! Hi Ninette. I left something on my blog for you. do please check it out ok. So lovely! I've got to try this before I run out of fresh peaches. Delicious & easy to prepare also! !